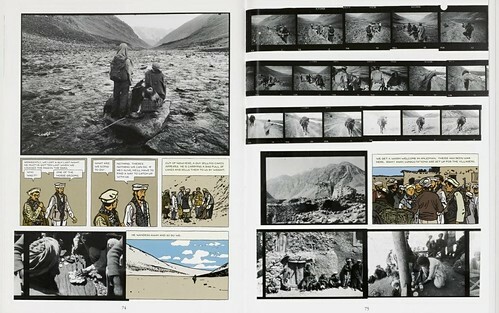 If a book like The Photographer already exists, I have certainly never seen it. 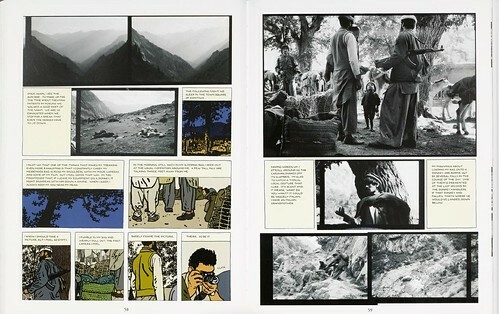 This three-way collaboration between the late French photographer Didier Lefèvre, graphic novelist Emmanuel Guibert and graphic designer Frédéric Lemercier is a breathtakingly original piece of work that reveals new possibilities for a medium, the graphic novel, that still divides readers into two camps. There are those who enjoy them, and those – especially in the UK – who can’t shake the feeling that to be caught with your head in a comic book would mark you forever as an emotionally stunted post-adolescent, no matter how often we are told that the graphic novel came of age years ago. 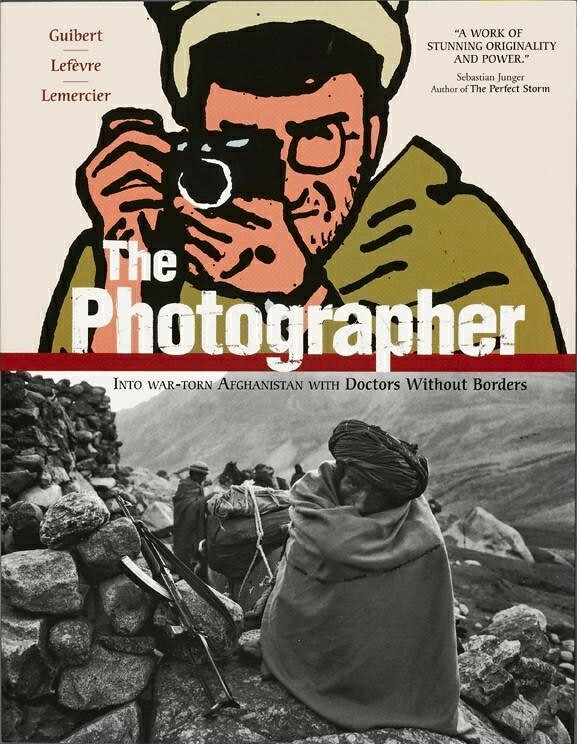 Top: cover of The Photographer, English language edition, 2009. The Photographer’s narrative density is highly involving. The journey on foot through difficult terrain is long, arduous and sometimes brutal. One of the horse grooms goes missing in the dark, while crossing a pass, and is presumed lost. He reappears in the morning against the odds, and Lefèvre captures the look of terror on his face. The pages devoted to the doctors’ labours at the makeshift ‘hospital’ at Zaragandara, with the booms of battle alarmingly close, are extremely moving. Lefèvre, aided by Guibert, shows us the doctors, who are able to cope with the most trying conditions, emptying out the socket of a man’s shattered eye and treating the burned hand of a small girl – an incident recorded with a sequence of twenty photos. One might argue, as some have, that photojournalism of this kind is intrusive and voyeuristic, though such scenes are taken for granted in TV documentaries. But MSF’s work continues in war zones around the world and The Photographer provides a brilliantly revealing document of its desperately needed efforts. The book’s international success is a welcome sign that there is an audience hungry for photographs that tell us something we urgently need to know about the world (see feature, ‘One Week in Pictures’). A donkey rests during the crossing of a shallow but fast-flowing river.